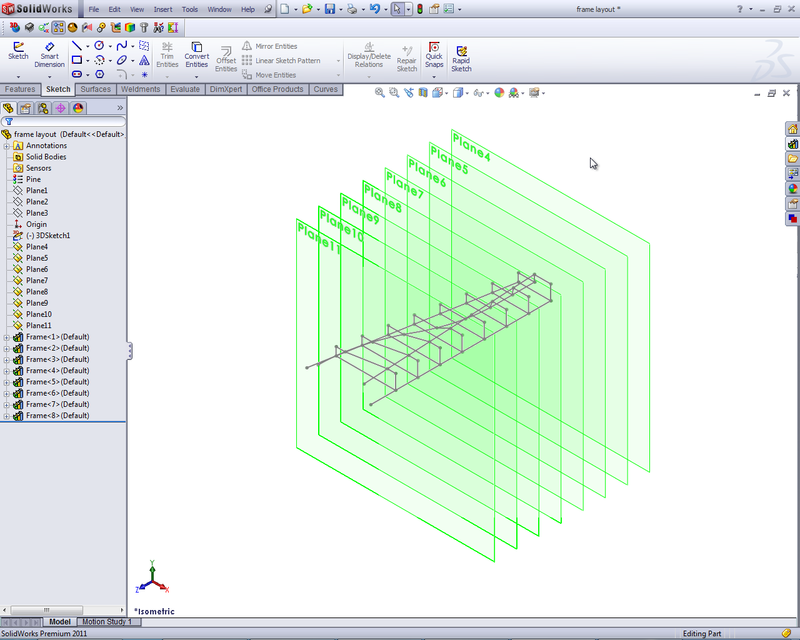 Continuing on with part 7 of our 8 part blog series dedicated to showing the differences between Autodesk Inventor Professional 2011 and SolidWorks Premium 2011 for digital prototyping workflows, we examine the ability to automate the design process by automating the creation of drawings for part families, creation of parts from parameters, and creating copies of an assembly constrained along a variable path. This test looks at simplified automation examples, yet it provides a glimpse of this capability in both products. Create a simple piece of stock lumber (2×4 board) and examine how a user can make that same part file represent several variations of lumber that could be used in a project. Automate the variation of individual drawing views, scales, and annotations. Automate assembly variations that vary by size and position. Autodesk provided us with three movies showing Inventor completing the tasks. They also provided three STEP files of the frame, the assembly, and the curves to follow for the frame assembly resizing. SolidWorks has some of the same capabilities built into the core modeling system and by using DriveWorks Xpress, a 3rd party add-in delivered with SolidWorks. It can handle configuring a part when placed into an assembly, but updating it in the part model on the fly is not possible. It was able to create the multiple configurations of an assembly – although it required more steps than Inventor to achieve the same solution. SolidWorks Premium was unable to automate the creation of drawings for part families, which requires users to go through the manual process of creating a drawing for each instance of the family. SolidWorks’ third party partner, DriveWorks, offers software that can perform this process, although at additional cost. The no-charge version was not able to control the final drawings, as desired. We did not evaluate DriveWorks, although the extra cost versions of DriveWorks Solo and DriveWorks Pro appear able to perform this task, again, at added cost. Autodesk Inventor includes iLogic and iCopy technologies that use rules to control the parameters of the part, assembly, or drawing and these capabilities were used to complete this test. Inventor created the lumber workflow, the frame resizing and the drawing scaling without flaws. Such design intelligence, in the case where repetitive designs or portions of repetitive designs are used, can radically reduce design time and produce more repeatable results. Autodesk Inventor includes iLogic and iCopy technologies that use rules to control the parameters of the part, assembly, or drawing. Inventor controls the parameters of a part through a single dialog box that updates the model on the fly. It is also able to automate the process of creating unique assembly configurations by modifying the parts and sub-assemblies automatically for the user. iLogic also can use rules to drive drawings – from view placement to scales and annotations – for a family of parts or assemblies, which can save significant amounts of time in large scale projects. SolidWorks has some of the same capabilities built into the modeler. It can handle configuring a part when placed into an assembly, but updating it in the part model on the fly is not possible. It was also able to create the multiple configurations of an assembly – although it required more steps. Without using extra cost third party software, SolidWorks is unable to automate the creation of drawings for part families, which requires users to create a drawing for each instance of the family. For the stock lumber workflow, both Inventor and SolidWorks were able to capture all the variations within a single part file. A family of parts or assemblies also requires a family of drawings to document their design intent. Recreating essentially the same drawing, which only varies by a few critical dimensions wastes time and effort. Inventor allows the user to easily automate drawings using iLogic functionality. Inventor drawings can be set up to automatically vary view placement, scale, and annotations for a family of parts or assemblies. SolidWorks, without extra cost third party software, is unable to automate the creation of drawings for part families. 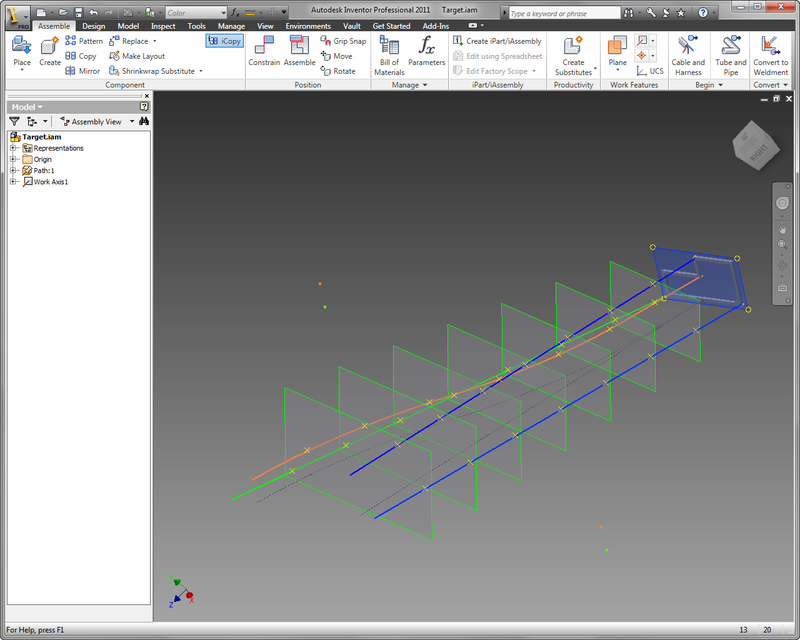 For the frame variation example, Inventor allows the user to automate complete assemblies that vary along specified paths. SolidWorks was able to manually model the frames along a path, but took substantially longer. The next, and final, blog in this series will examine Mechatronics – the ability to perform cable and harness design from an imported electrical wiring diagram. Stay tuned or sign up to be notified of my blog updates.